Clear skies ruled as the Amazing WE CARE Race 2018 unfolded in the western part of Singapore this morning. This year, the 4th Race WE CARE has held, the focus was not on speed but rather on creativity. With the theme of Art-in-Motion, the first challenge was Chalk-A-Lot, where teams had to design and draw a mini-lot with coloured chalk incorporating their logo. Next, the teams had to get to Haw Par Villa via public transport for Challenge #2, to paint a face mask each. Finally, back to Jurong Town Hall for the third task of creating an origami dodecahedron, a 12-sided figure made entirely of paper. A buffet lunch followed at the nearby Genting Hotel Jurong, where we were treated to a performance by the artiste of many faces, who entertained the audience with the renowned Szechuan opera art of face changing. At the lunch, our CEO Yuen Han, gave out 4 awards. The prize for best dressed team was won by the Magnums, who were dressed like their favourite private investigator from the tv series Magnum PI. The team were sportingly decked out in sunglasses, moustaches and Hawaiian shirts, a tribute to the way the series’ leading man, Tom Selleck, was typically dressed. When asked, the Magnums to a man declared they are “fans of the original tv series” which gave them the inspiration for dressing up for the Race. In addition to being the best dressed, the Magnums also took the prize for the team that finished all 3 challenges in the fastest time. 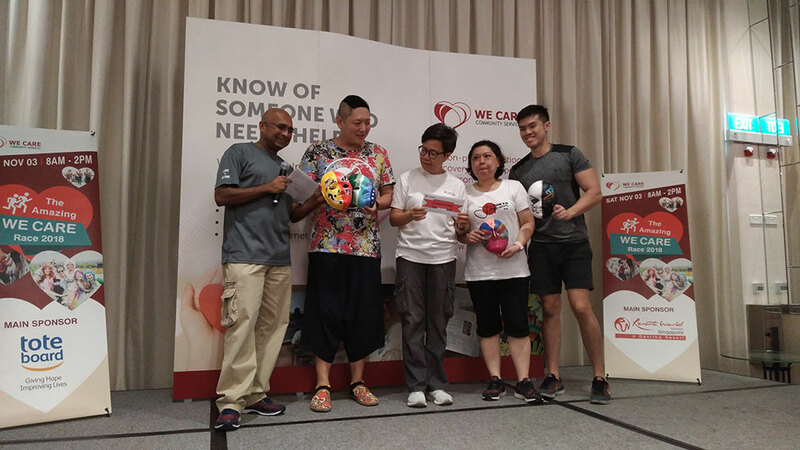 The Jollys from SingTel received the prize for their triumphant chalk lot, while victory for the most creative face masks went to Quad Squad from WE CARE. From the feedback we received, this was also the event that most teams found the most enjoyable. For the best origami sculpture, the honours fell to Van Go(gh) Go from Marina Bay Sands. The team said that they “worked on a prototype” before embarking on the second and final piece. The Amazing WE CARE Race 2018 is proudly brought to you by major sponsors Tote Board and Resorts World Sentosa. The Board and staff of WE CARE thank all participants, donors, sponsors, volunteers and organisers for their part in making this event a success. In particular, we gratefully acknowledge the roles played by Tote Board and RWS. We hope everyone had a fun time and we hope to see you all next year.